Rainfall and river level maps for today (above), Thursday 28 (below) and Friday 29 June (bottom). The rainfall maps are for the 24 hours to 9am, and the river levels are as at 11pm each day. Storm to gale force winds battered VIC today while an extreme rainfall and flooding event unfolded in Gippsland. A huge pressure difference developed across the state this morning as the westernmost East Coast Low shown on the surface charts below pushed westwards into a high over SA. At 4am, the pressure in Adelaide was 1024hPa, 33hPa higher than the centre of the low close to Gabo Island. This pressure gradient forced a strong and moist airstream onto the Gippsland coast. It deluged southeast-facing valleys and mountainsides in West Gippsland with record rain, and brought flooding across all Gippsland and damaging winds to eastern and central parts of the state. Heavy rain began falling in East Gippsland mid-evening yesterday, and spread to West Gippsland around daybreak today. The 24-hour to 9am rainfall totals (see wettest) showed that most of East Gippsland had received between 50 and 90mm, with some intense falls spreading from the east (see downpours). Mallacoota recorded 66mm between 9pm and 3am and Mt Nowa Nowa 55mm between midnight and 6am. Gabo Island Lighthouse recorded 90.2mm for the 24 hours, its heaviest one-day June total in 140 years. 58mm of that fell in 6 hours to 3am. Event totals for East Gippsland, spread over the 48 hours to 9am Thursday, were remarkably consistent, almost all between 80 and 120mm. In West Gippsland, heavy rain began around dawn and fell continuously for 24 hours or more, with the majority of the rain being recorded in the 24 hours to 9am Thursday. The maps at right show that very heavy rainfall occurred in the Thomson, Macalister and Avon catchments to the north and NW of Sale, while a small area south of Traralgon also recorded high totals. Records were set at a number of locations. Woods Point's 101.0mm was its highest June one-day fall in 114 years, while Erica's 138.2 was an all time high in 47 years. Some rainfall was phenomenal. The automatic flood warning raingauge on Mt Wellington, 70km NNW of Sale on the watershed of the Avon and Mitchell catchments, reported 318.6mm for the 24 hours to 9am Thursday, a new Victorian record for June (the all-time record for VIC is 375.0mm at Tanybryn in the Otway Ranges on 22 March 1983). A break-down of this total into the eight 3-hourly periods 9am to 9am shows how unrelenting the rain was: 61 65 43 33 33 28 32 23mm. Even more phenomenal were the reports coming from the automatic weather station on Mt Baw Baw, which lies between the Thomson and Latrobe river catchments. Between 9am and 4.30pm it reported that 355.6mm had fallen causing concern that it was giving false data that may be misleading in an emergency situation. The figures were extraordinary, but internally consistent and temperature, wind and other elements being reported by the AWS appeared reasonable. With no nearby gauges or other means of immediately verifying the data, however, the Bureau suspended public reports from the AWS at 4.30pm pending further investigation. What reports were issued are summarised in downpours. Avon catchment: Mt Moornappa 195, Briagolong 143. Gale force winds swept many parts of the state throughout today and well into Thursday, with some gusts reaching hurricane force. Damage, mostly to trees and power supply lines, was widespread. A man was killed when a 30m tree was blown onto his home at Mt Macedon late this evening, nearly cutting it in two. Extensive damage to trees and powerlines occurred in central Victoria, with damage reported from Woodend, Gisborne, Macedon, Mount Macedon, Lancefield, Romsey, Tylden and Rushworth. Many roads were blocked by tree debris. About 15,000 properties were without power after powerlines were blown down or brought down by falling trees and branches. Worst hit areas were Bairnsdale, Lakes Entrance, Sale, Maffra, Kinglake, Lilydale, Belgrave, and the Kyneton-Woodend area. A man was injured when a tree fell on his stationary car while he was waiting for other trees to be cleared on the Princes Highway at Munro, NE of Stratford. Fallen trees closed the Mt Dandenong Tourist Road for several hours. Trees blown onto the track forced cancellation of Melbourne to Bairnsdale train services and their replacement by buses. Highest reported gusts were in Alpine areas (Mt Hotham 137, Mt Buller 120, Falls Creek 115km/h). Some unusually high gusts were recorded in less exposed locations, however, including Kilmore Gap 111, Bairnsdale 96, Eildon Fire Tower 94, Dunns Hill (near Mt Dandenong) 93 and Mangalore Airport 91 (a new June record). Some 24-hour average windspeeds to 9am Thursday set new records - Mildura, Tatura and East Sale all had their windiest June days on record, while in the North Central district, Kilmore gap averaged 55.2km/h and Redesdale 44.1km/h over the full 24 hours. The Windiest and highest gusts sections below and for Thursday show the highest 24-hour average speeds and the highest gusts recorded. The torrential rain this morning caused rapid rises in the Thomson, Macalister, Avon and Mitchell Rivers. Runoff entered the streams more rapidly than usual because large areas of the catchments have not yet regained a covering of vegetation following last summer's devastating bushfires -- a good vegetation cover slows down water as it makes its way into streams. At 9 this morning, all rivers were below minor flood level. The map opposite for 11pm this evening shows that in just over 12 hours the Macalister, Avon and Mitchell Rivers had risen to major flood levels, and the Thomson to moderate level. Swifts Creek on the Omeo Highway south of Omeo was cut off this morning when the Tambo River rose dramatically. Licola on the Macalister was similarly isolated. The Princes Highway was cut by the flooded Nicholson River at Nicholson, east of Bairnsdale. Roads cut by floodwater included the main Bengworden and Marlo Roads. SES personnel were sandbagging and doorknocking to alert residents to major flooding in Stratford and Bairnsdale, and at Boisdale on the Avon River. A number of schools through Gippsland were closed due to lack of electricity or inaccessibility due to flooding. Flood warnings were in place this evening for: major flooding in the Avon, Macalister upstream of Lake Glenmaggie, Thomson and Traralgon Creek at Traralgon; moderate flooding in the Latrobe, Snowy, Buchan, Tambo and Nicholson Rivers, and the Canna and Genoa Catchments. 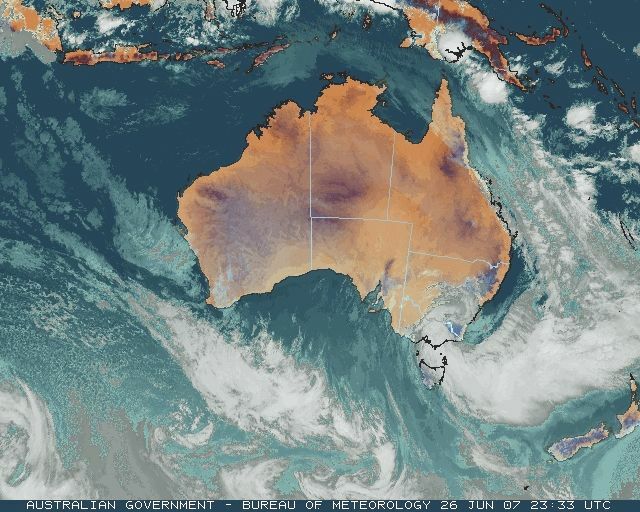 A pair of East Coast Lows menaced the NSW coast today. 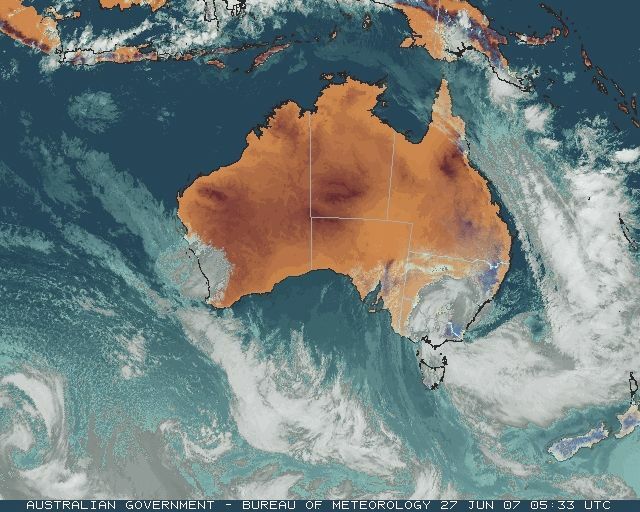 They can be seen on the surface charts below, slowly dumbbelling around one another under the rotational influence of an upper low that intensified over eastern NSW during the day. 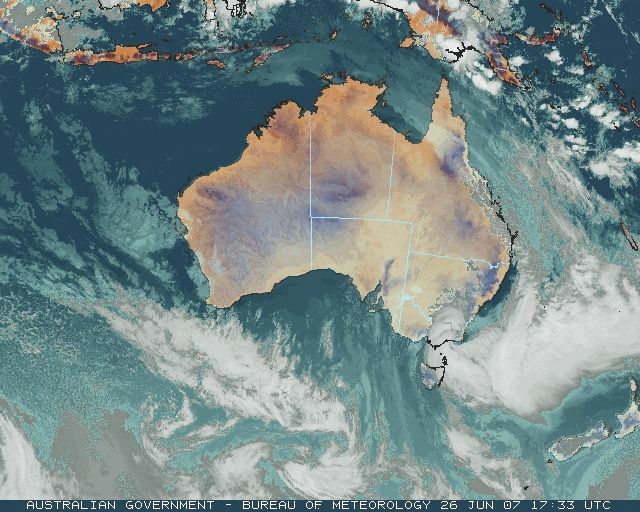 The upper low also dragged colder air northwards to progressively cover most of NSW as the day progressed. The surface low that moved to the South Coast overnight moved across the coast into the Southern Tablelands during the morning, then shifted northwards into the Central Tablelands later in the day as it weakened and became absorbed by the dominant Tasman sea low. By late this evening, this second low had deepened to 993hPa and was approaching the far South Coast. The heaviest rain fell in the Bega Valley yesterday and up to the early hours of this morning, with top falls around 70 to 80mm (see wettest). Streams ran high, with water just under the Princes Highway bridge over the Pambula River, but no flooding was reported at minor levels or above. Strong winds were reported, with ample evidence of gale to storm force winds in mountainous areas coming from widespread reports of large tree damage. However, the only significant strong wind gust reported in NSW was 115km/h at Green Cape on the far South Coast. A house at Tura Beach, just north of Merimbula and 50km north of Green Cape, was damaged by a tree blown onto it. There were also reports of many trees down on the far South Coast. Snowy Mountains: Resorts reported up to 40cm new snow yesterday and today. Cooma - Monaro: Snow around Cooma was widespread and particularly heavy around Nimmitabel and Berridale. The Snowy Mountains Highway was closed between Cooma and Brown Mountain and between Cooma and Adaminaby. Roads northeast of Cooma were also closed by snow as was the Monaro Highway between Nimmitabel and Bombala. Country Energy reported major blackout problems around Berridale, Adaminaby, Bombala and Dalgety with all available staff trying to restore power, but experiencing access difficulties in the snow. Canberra: Extensive snow settling to the 1000m level was reported on the ranges west of Canberra at 9am. Captains Flat SES reported heavy overnight snow settling in their area and across to Bungendore. Batlow - Tumbarumba: Heavy overnight snow fell in the Bago State Forest south of Batlow, with around 5 to 10cm cover at the 1050m level. Orange-Blayney: Snow began falling around Orange about 8am, when a 4-car accident closed an icy Mitchell Highway at Lucknow, just east of Orange. By midday, snow was reported settling from Orange to Blayney and to the northeast of Orange. The Mt Canobolas road was closed around 2pm. Oberon Plateau - Crookwell - Taralga: Snow began falling around Oberon, Crookwell and Taralga about 8am. Higher country around Taralga had a 4cm cover mid-morning, while there was a 10-15cm cover in the high country (1100 to 1200m elevation) to the north around Gurnang. Snow began to settle around midday in Oberon, resulting in schools closing so that students from outlying properties could get home before roads closed. Moderate to heavy snow was falling from Hampton to Oberon mid afternoon, with snow 3cm deep in Oberon at 3.30pm. Snow 15cm deep was reported at Black Springs, 20km SW of Oberon, at 4pm. At 7pm, snow was 6cm deep in Oberon township, with flakes "the size of 50 cent pieces" falling. At the same time, there was a report of people being "snowed in" at Hampton. At 8pm, a farm out of Oberon reported 10cm covering paddocks. On Thursday, powder snow was reported falling south of Oberon along Mozart Road for about four hours around midday. Lithgow - Bathurst: Snow began falling along the Great Western Highway from Yetholme to Mt Lambie before midday, and soon afterwards was reported falling in Portland and Sunny Corner. A few centimetres had settled down to the 1050m level around Yetholme by mid afternoon, and the Highway was closed between Mt Lambie and Yetholme at 3.45pm and between Mt Lambie and Bathurst Airport at 6.45pm. It reopened about 4.30am Thursday. Snow flurries were reported in Lithgow late afternoon. Blue Mountains: Light snow showers were reported mid afternoon in the upper Blue Mountains at Mt Victoria, Blackheath, Medlow Bath and Katoomba, but did not settle. About an hour's heavier snow at Mt Victoria, from 4 to 5pm, also did not settle. At 9.30pm, snow was reported settling at Clarence, about 5km east of Lithgow. Coonabarabran: Snow fell during the afternoon and early evening at Siding Springs Observatory, 20km west of Coonabarabran at an elevation of 1120m in the Warrumbungles but did not settle. Northern Tablelands: Snow fell during the early morning hours of Thursday, with 4cm reported by the Guyra observer at 9am. Bureau observers at Glen Innes and Woolbrook also reported snow, but did not say if it accumulated on the ground. Travel advisories were in effect for the New England Highway at Ben Lomond Range north of Guyra and between Guyra and Armidale. Thunderbolts Way was closed between Gloucester and Nowendoc where it rises to about 950m. Snow 2-3cm deep was observed around midday Thursday on the Ben Lomond Range, with snow falling for over an hour soon after. 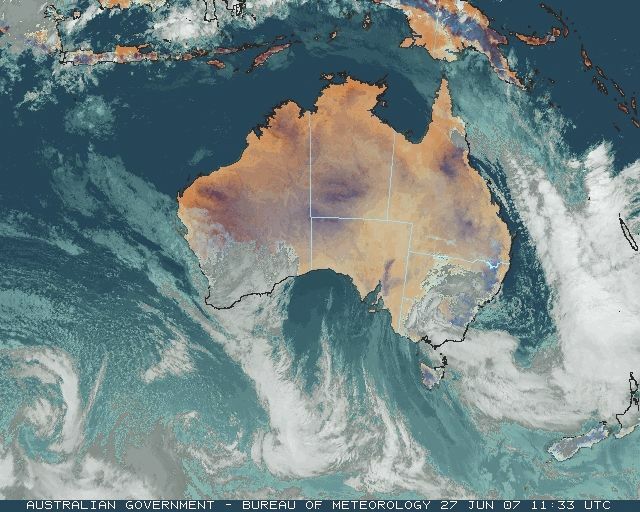 The easternmost East Coast Low on the surface charts below bullied Lord Howe Island overnight, giving the airport anemometer a workout that saw a new record daily wind run for June. 1398km of air passed the anemometer cups in the 24 hours to 9am, an average speed of 58.3km/h. 57mm was recorded in the raingauge between midnight and 9am as the low approached the island then headed for the NSW South Coast. These records are based on data received as at 0647 EST on 21/08/2008. Help in interpreting these statistics and information on quality control is here. 1 Y Equal to record. Previous record set earlier this month. Data is as received at 00:50EST, 15/05/2012.